Little Byre is a charming nineteenth century two bedroom Cumbrian cottage, tucked away in a quiet corner of pretty Baggrow Village in north Cumbria, just outside the Lake District National Park. 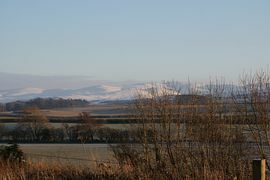 It enjoys wonderful uninterrupted views across open countryside South to Skiddaw and nearby Carrock fells. Despite Little Byre's sleepy location, within approximately 30 minutes by car, you can be in Carlisle, Whitehaven and Workington, with the attractions of Keswick and Cockermouth even closer, not to mention the lovely Solway coast. A short walk away there is a local pub where you can eat, as well as a number of other establishments within a 3 mile radius. It is an ideal location to enjoy all the northern Lake District has to offer whilst providing a perfect place to get away from it all! Two bedrooms - one double and one twin. Little Byre has been furnished to the highest of standards. 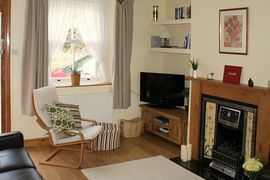 The living room is furnished with quality oak furniture and soft leather furnishings. It has a large flat-screen TV, DVD and CD player, an extending dining table for four and a cast iron, living flame gas fire; along with a range of books, games and jigsaws for your enjoyment. 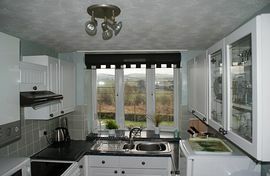 The kitchen is a pleasure to use, particularly as it enjoys such wonderful views. It is fully equipped with electric cooker, microwave, fridge/freezer and washing machine and a full range of white cookware, crockery and utensils. 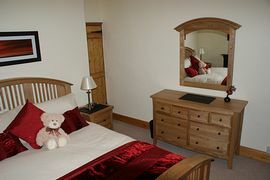 The master bedroom has a king-size bed and is beautifully fitted out with matching solid ash furniture. A double wardrobe and six drawer dresser provide ample storage for all your clothes. The rear bedroom with its pine furniture can accommodate 1 or 2 people. The bathroom has a full size bath (with shower over) and a shaving socket. Towels and linen are provided and all gas and electricity are included in the price. Outside, a small,South-facing, enclosed terrace, with patio table and chairs, provides a lovely peaceful area to relax and unwind, whilst enjoying the view. Quality cotton bed sheets, duvet covers and fluffy white towels are included in the rental price. A small enclosed pretty patio area with garden furniture provides a place to relax and admire the view. Little Byre is situated in the village of Baggrow in Cumbria and is very easy to find by car. Little Byre is the pink cottage. Travel west on B5305 towards Wigton. After 20 miles, road reaches the A595 at a T-Junction. Turn left and follow A595 for about 7 miles. Turn right off the A595 (signposted Blennerhasset/Baggrow). Follow road through Blennerhasset, over bridge and climb hill. Railway Terrace is about 1/2 mile on the right. Low Season: £210 - £275. Mid Season: £300 - £345. Short break tariffs on request. Changeover day is Saturday for week long breaks.